Very busy few days here. 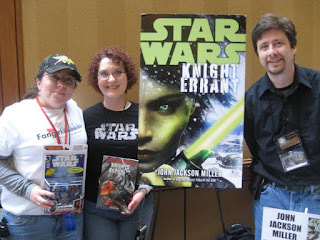 Two podcasts to share, starting with my C2E2 interview with Force-Cast's Jedi Journals. And I just now recorded the first of what may be more than one interview with DragonTalk Radio; click to listen. 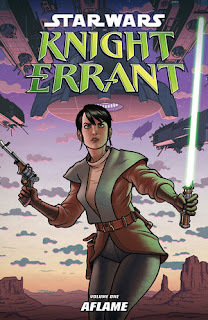 I'm also pleased to report there is a release date for the Knight Errant: Aflame trade paper back: August 3. You can find the preorder page for Amazon behind the link; you can begin ordering it at your local comics shop in June. More details and a page for the volume here on the site soon. 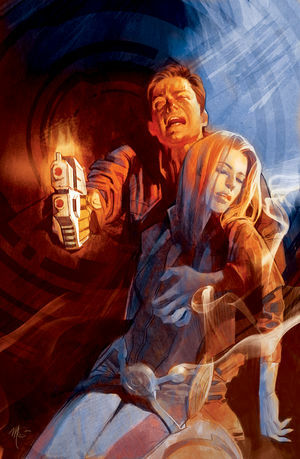 Been a little slow to get back online after the Chicago/Memphis trip, but I am pleased to say that I finally have the production notes for Knight Errant: Aflame #5 online here at the site. This is pretty darn late and if I were the publisher of this website, I would fire me. (Errr... wait. Never mind.) No, I admit I've had enough real deadlines to keep this winter that some of my usual postings here have slowed down, but that's a good problem to have. I do hope to have the Mass Effect Evolution notes and something for the latest Lost Tribe of the Sith chapters up in the near (ahem) future. With Nicki Howe and Kurt Busiek at a Saturday panel. That near future contains Odyssey Con in Madison, this weekend, where I'm speaking on panels Friday and Saturday. It's my first Oddcon, despite having lived in the state for many years, so it should be a fun experience. I'll have the panel schedule online here later in the week. And speaking of fun experiences, Midsouthcon was great, as always. I haven't missed one since 2003, and this one was memorable as usual. 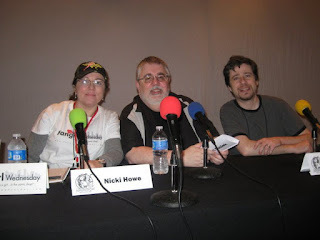 Kurt Busiek was the comics guest of honor, and it was great getting to know author Mary Robinette Kowal, game guru Monte Cook, and scientist Les Johnson. It was a lot of fun hanging out with the Memphis Fanforce, as usual, and my thanks to them for the use of their table. Thanks also to loyal minion Cathe and to Lin Workman for the photos. With Nicki and Traci Howe from the Memphis Fanforce. Thankfully I was feeling a lot better than I did at C2E2 — and I really liked the new venue. Despite having driven past the Hilton in Memphis for years — previously, it was the Omni and before that, it was the Hyatt — I don't think I had been in the place except once for a one-day comics show in 1992 or so. The function spaces were nice and parking wasn't a nightmare for a change (although we seem to get struck with the worst weather, lately). Apart from the intervention (unwarranted, to this observer in the room) of security closing down the Libertycon party, I have no complaints — the hotel even shipped me the power cord for my computer which I forgot!